By the late 1920s, the car buying public could have just about anything it wanted, from value cars to custom bodied sculptures. While automotive options were plentiful, the one thing that eluded buyers was a really, REALLY big engine. As the 1920s came to an end, four and six cylinder engines were ubiquitous and the eight was rather common too. In January, 1930, the ultra-high end luxury segment would get what it wanted when Cadillac introduced their V-16. In 1931 Marmon would also join the ranks of American manufacturers offering a V-16 but the timing for both of these companies couldn't have been worse. During the production run of the 16-cylinder masterpieces, these two manufacturers produced wonderful sales literature to advertise their cars. Here are three of my favorite V-16 Cadillac pieces. 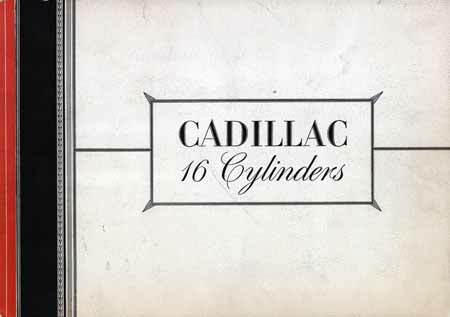 The first catalog, issued in 1931, was simply titled "Cadillac 16 Cylinders". It measures 14-1/8" X 10" and the cover is trimmed in red and black ink. As the cover opens we are greeted with a beautiful illustration of the engine and a description of the engine as "smooth, uncommonly capable, quiet and powerful." The description goes on to match the quality of the new engine to Cadillac's "unmatched record", proudly stating the new V-16 is "the ultimate triumph" of "Cadillac's famous V-type principle." Moving away from the engine, the catalog's only other text page described the coachwork and features of V-16 bodies. Potential buyers were encouraged to leaf through the remaining eleven pages of black and white illustrations and 31 half-sheets of body styles drawn on tracing paper. After careful consideration buyers should then "Select a body type, and pencil on the drawing the modifications you would like in it. Indicate the colorings as you prefer them. Select the upholstery materials. Then ask your dealer for an estimate of the time required and the price for a car so built." 1931 Cadillac 16 Cylinders brochure. In 1938, a 12" X 8-5/8" Cadillac Sixteen folder begins with a description of the line's redesigned engine. From 1930 to 1937 Cadillac's V-16 engine was a 7.4L, 452 cu. in. behemoth. In 1938, Cadillac refined the V-16 into a 431 cu. in. 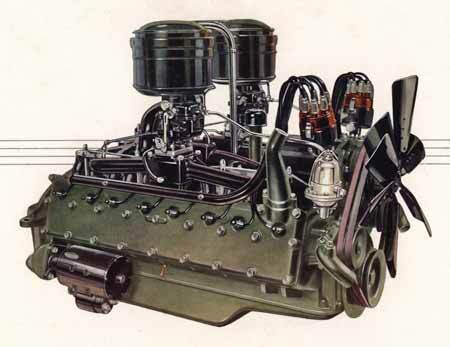 flathead that "reveals a smoothness, acceleration, and speed that literally have no counterpart in any car on earth." That year the car's wheelbase was reduced to 141" and the folder reported that balance and handling were also improved: "Gone are the traditional parking difficulties. Frail feminine hands are easily its master in the most complicated traffic." With difficult economic conditions fresh in everyone's mind, Cadillac branded the 1938 V-16 as "the most practical luxury car ever built" pointing out that the car "provides plenty of room and comfort without excessive size." The $5,140 entry price into the V-16 line placed the car "well within the range of the 12-cylinder cars." The third piece is a beautiful portfolio for the 1938 V-16. The outer cover is red and accented with silver lines. 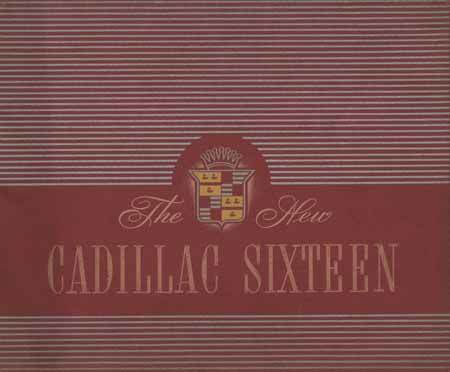 The title, "The New Cadillac Sixteen", is embossed on the cover and features orange script. When the reader opens the portfolio he is greeted with a single page of text. 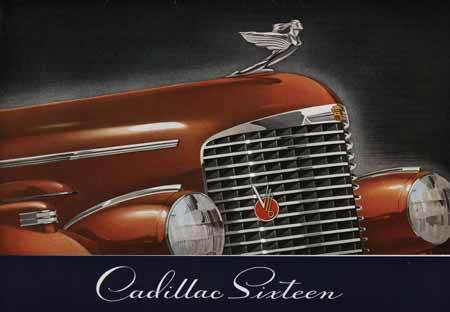 Here it states that Cadillac's intention of redesigning the V-16 was "to create a car so obviously superior that it would be accepted without question as the new standard of the world in luxury, comfort, safety and mechanical convenience". This car would be appreciated by "those who unerringly gather among their possessions the finest things that life affords." After reading the introduction, the portfolio opens to release ten individual plates measuring 13-1/4" X 11" illustrating the engine and each body style offered. On the opposite side of the bodies there are illustrations of the car's interior and a brief description of features and accoutrements. The illustrations are all in full color and a truly impressive presentation of the V-16 Cadillac. New Cadillac Sixteen Brochure of 1938. 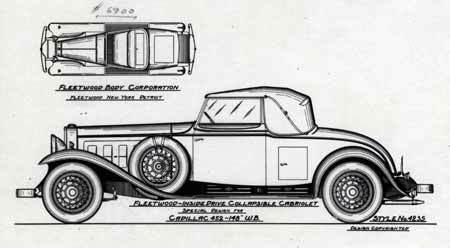 One of the six plates showing choice of body for the '38 V16. The Cadillac V-16 were produced from 1930-1940. During those ten years just 4,076 V-16s were built. Nobody can predict how many V-16s would have been built if The Great Depression had never happened. The cars were big, beautiful, graceful and powerful. At the top of the food chain in high-end luxury market the V-16 Cadillac had only one other American rival; the Marmon Sixteen. The 16-cylinder battle between Cadillac and Marmon only overlapped three years but their legacies continue to live on today.